We got the challenge to create an interactive game specially created to better communicate Volvo cars safety technology to people independent of age, gender or understanding of technology. We come up with the Play IntelliSafe Game! The player clearly get to experience how IntelliSafe help in preventing accidents and how the driver is protected in an event when it occurs by launching virtual Volvo Cars onto a into a beautiful glass table. The glass table serves as the main screen and game board and it is connected to six surrounding tablets dedicated to the players. From the surrounding tablets the players launch Volvo cars onto the game board where they interact with other cars in various ways depending on if they are kitted with IntelliSafe or not. The players can also access a set of IntelliSafe videos to get more in depth understanding of how the different safety features work. 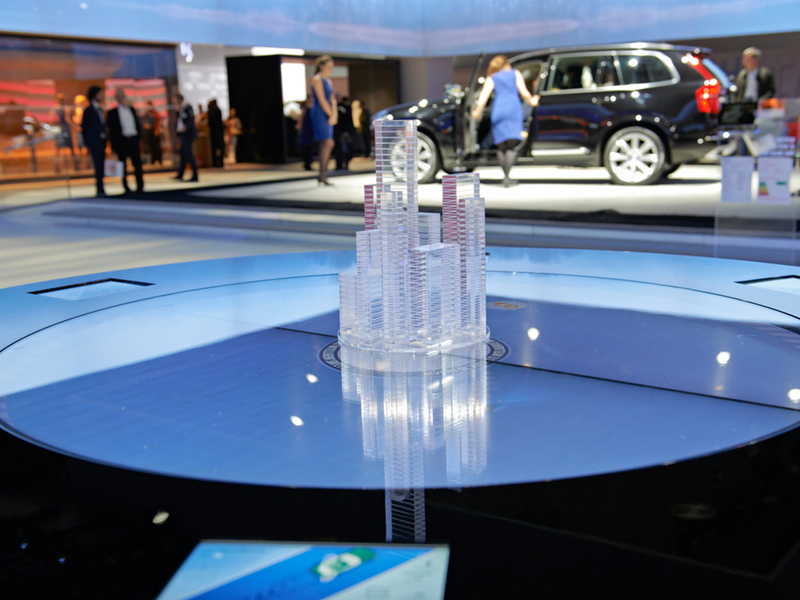 The Play IntelliSafe game was nicely synched with the unique weather machine on the Volvo stand, so when it was snowing on the new XC90 displayed as the centerpiece, snowflakes twirled around inside the game too. At the Paris Auto Show 2014 visitors to the Volvo stand had the opportunity to, in a playful, innovative and interactive way learn more about the company´s groundbreaking safety technology IntelliSafe. Play IntelliSafe is an interactive game specially created for Volvo to better communicate their safety technology to people independent of age, gender or understanding of technology. Play IntelliSafe is integrated into a beautiful glass table. The tabletop serves as the main screen and game board. Six surrounding tablets are dedicated to the players. From these, the players launch Volvo cars onto the game board where they interact with other cars in various ways depending on if they are kitted with IntelliSafe or not. The players get to experience how IntelliSafe helps in preventing accidents and how the driver is protected in such an event. From the tablet, one can also access a set of IntelliSafe videos to get more in-depth understanding of how the safety features work. The Play IntelliSafe game was nicely synced with the unique weather machine on the Volvo stand. So, when it was snowed on the new XC90 displayed as the centerpiece, snowflakes floated around inside the game too. Thank you Volvo Cars & SCP GREY for project coordination!